We've had a lot of wrestling in the house lately. The boys like to wrestle but lately Dustin has discovered that Brooklyn is fun to wrestle with too! 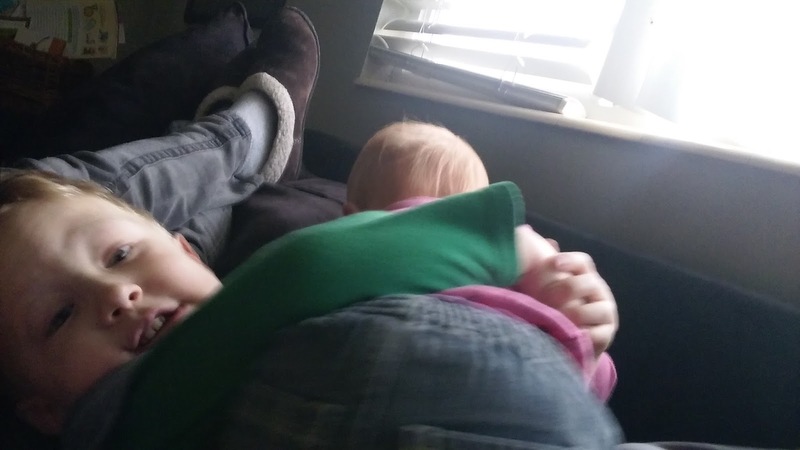 He knows she can't handle tough wrestling so he usually lets her win. When he's is tired he will exclaim "AAH Mom! Boo got me! She's so tough!" And she responds with laughter. Dustin had his 4th birthday in November!!! For WEEKS leading up to the big day he asked if it was that day. His favorite give was a HUGE teddy bear that might just be bigger than me. 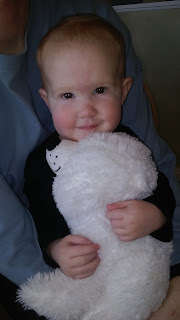 He drags it around the house, snuggles with it when we read, and puts it to bed at night. 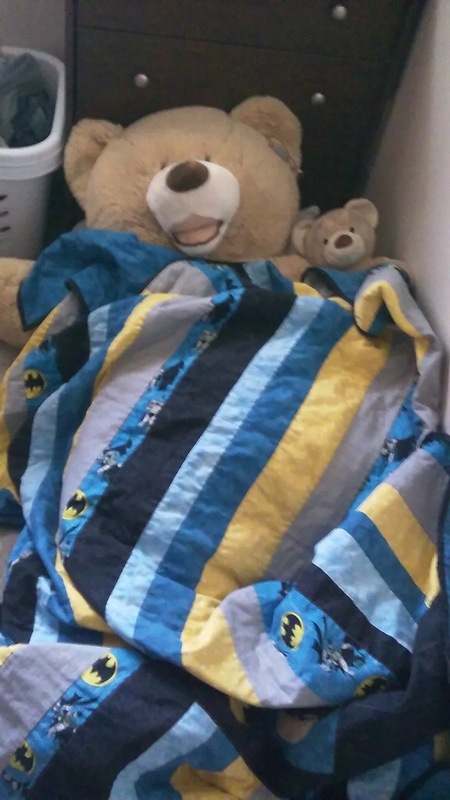 He insists the bear needs his own blanket and animal to snuggle with. He insisted on a big orange circle cake with lots of sprinkles and I did my best to comply. 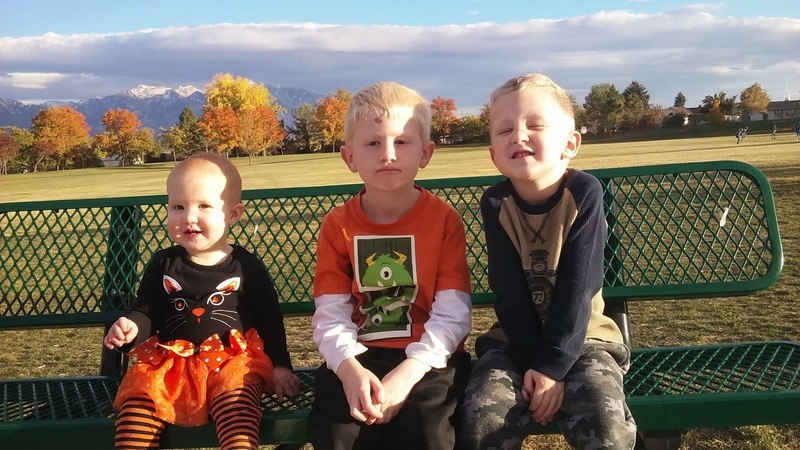 This month Logan's school did Red Ribbon Week! It's where the kids promise to be drug and bully free. 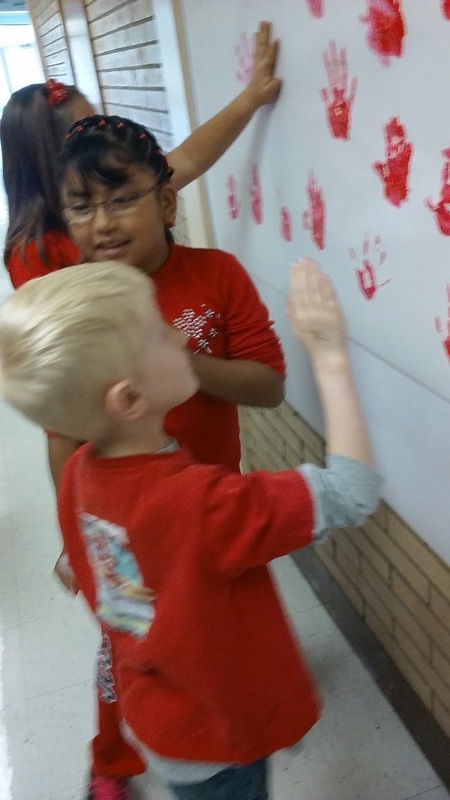 The PTA decided the kids would sign their pledge with paint hand prints. Dustin, Brooklyn and I got to go help the kids with the paint and discourage kids from painting the bathroom walls. They loved it, along with the rest of the week's activities. Logan's favorite day was either Crazy Hair Day or PJ day. 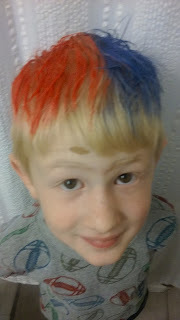 He thought it was pretty cool to go to school with red and blue hair. 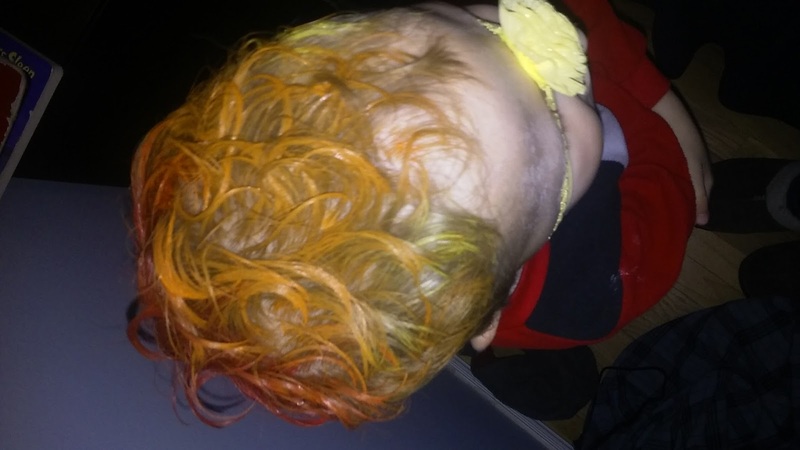 Dustin was initially excited to get to do crazy hair too, but after doing his hair, red in the back, orange and yellow on top he got pretty upset. I don't know if he was upset the color didn't show up as well on his brown hair as it did on Logan's strait, if he was sad his hair turned curly with the paint, or what. But his hair lasted all of 2 minutes. Dustin has had quite a few hilarious lines lately. He's such a crack up! We're in the waiting room for Dustin's exam and I review what the Dr will be checking out. His response was "Um Mom? I'm not wearing underwear. Do you think the Dr will be embarrassed?" Sigh! Dustin pointing asks "What's in that Ladie's shirt?!?" Me: She's pregnant, so a baby. Do you remember when Brooklyn was in my belly? (Brooklyn lifts up her shirt and points to her belly) Dustin responds "You never looked like THAT." Me: yes I did, but the Dr took the baby out so I don't look like that now. Dustin asks "did it hurt?" Me: Yes, but it doesn't hurt now. Dustin exclaims "POOR MOM!" A few nights ago we were eating asparagus with dinner and I commented that my Mom doesn't like it. Dustin exclaims "What is wrong with Grandma? Even the baby likes asparagus!!!" To which Logan responds "What is wrong with all these Plastows? I prefer licorice." Last week we got to go on a work date night! 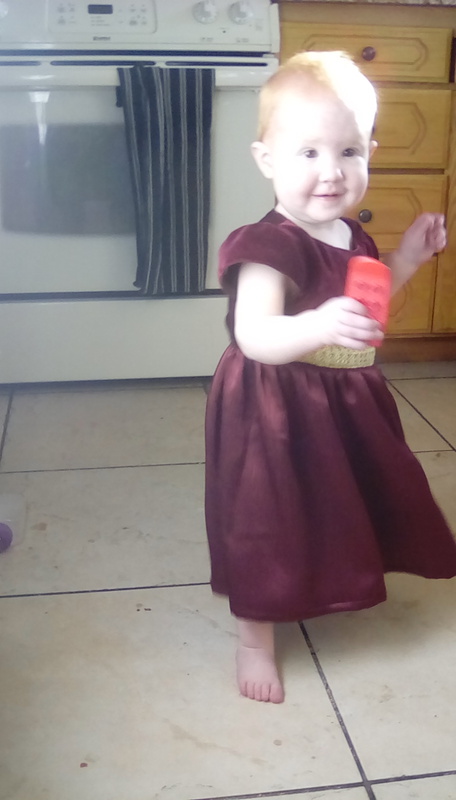 One of the companies Dave's company works with was doing dinner and a movie (Justice League) so we asked Grandma Linda to babysit so we could go. They also provided popcorn and drinks. It was a nice break. We haven't gone on a date away from the kids in a while (besides the temple a few weeks ago) so it was really nice to get out and relax! They also had gift bags for the kids that attended. 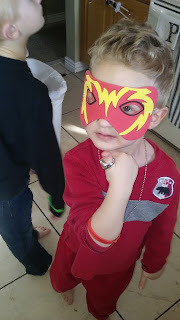 It was a reusable Super Hero bag full of Pez dispensers, super hero masks, necklaces, rings, bouncy balls, stickers and all kinds of other fun stuff. Of course we grabbed one for each boy! I've been working on Christmas gifts!!! Last week I finished a baby blanket for Brooklyn's baby doll. 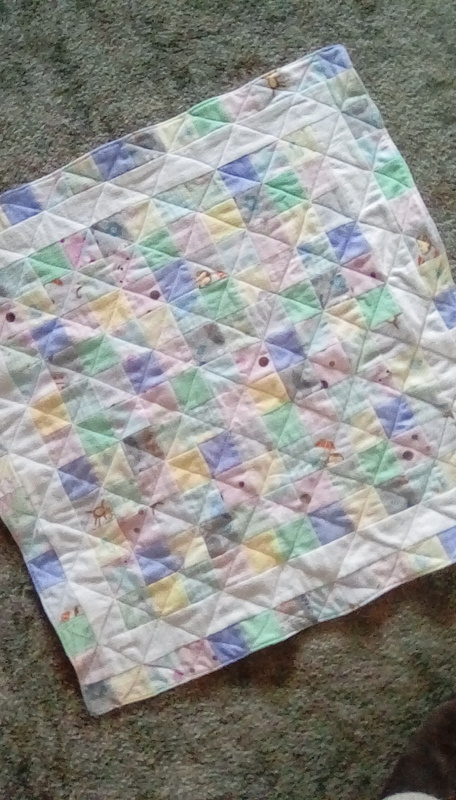 This might look big from the pic, but the squares are 1.5 inches. They're so tiny but SOOO cute! I've got this and a set of magic bottles (the ones that look like the milk and juice is being drunk) for her. 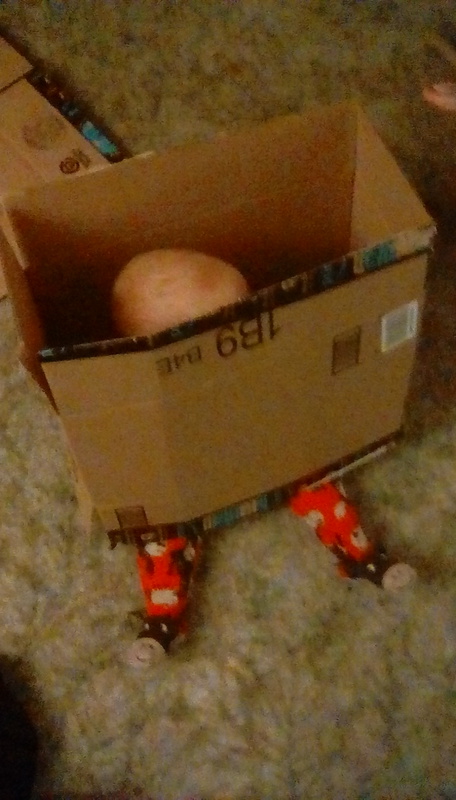 I've bought all her gifts for Christmas already, but this is the one I'm most excited to give her! And all it cost was my time. 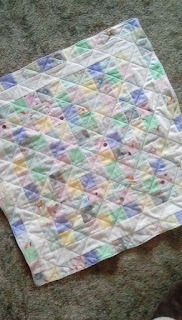 The material was all scraps from old jammies my Mom, Granmda Yoder, or I have made. Last Wednesday we got a new mattress! 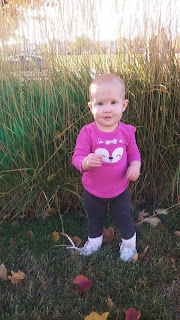 I've been having hip & muscle pains since I was pregnant with Brooklyn. I always get them when pregnant but this time they haven't gone away! The bed hasn't cured me but since getting this bed I've actually been able to sleep. I used to be up tossing and turning a few times a week because it hurt so bad. Now it hurts when I lay down, but doesn't hurt after a while and I can sleep! So big win there. It was on early Black Friday sale so we got it $100 off plus free pillows! Thanksgiving was last weekend and we enjoyed our time off. Logan had a whole day of school Monday and a half day Tuesday. So he was home to help Dustin and I prepare for the big day. We made rolls and mashed potatoes to bring to Dave's family for dinner. Logan requested we make a pie just for our family because "we always have pie at Thanksgiving but we never have any to bring home for leftovers!" So we made him a pie. We did a little Black Friday shopping, but mostly on the computer. I braved Walmart for half off socks & underwear for the boys. Because those are NEVER on sale. Dave and I also ordered new cell phones online. They were 80% off. Ours have been dieing for at least a year (I can't remember when we got them). He can't call me for some reason and both of us can't recieve group texts most of the time. I've also had problems sending picture texts lately. Also both of our screens are cracked. I wasn't planning on buying new ones (the old ones still worked) but when I saw I could get us both new ones for less than half of one normally, I was sold. We've also been posting the pile of stuff we've been meaning to sell online. Like an old TV, old watch, movies. All kinds of things we don't use but think someone might want. So far we've sold 5 of the items. 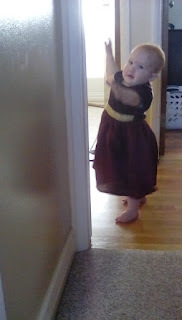 Brooklyn has taught herself to open the childproof lock for under the kitchen sink. I thought it was Dustin opening the cabinet (he only recently learned how to get in) and hiding the locking device. But after putting it back on for the third time yesterday I stayed in the kitchen reading and watched her do it!!! So I had to install the permeant locks that I have on the drawers. Little punk. This week I've worked 2 hours a day and the great part about working is I can work on a project while I wait for someone to answer the phone. 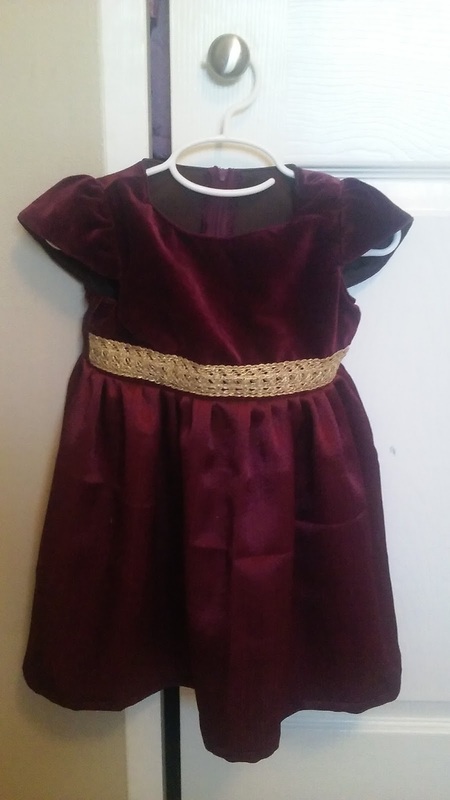 Yesterday I drafted, and cut out this dress for Brooklyn for Christmas! Last night Dave was exhausted and fell asleep at 9 so I stayed up and sewed it together too! So a dress in a day. It turned out pretty cute for a "what's in my stash that might make a cute Christmas Dress?" I even had the maroon zipper in my bag of a million zippers! As soon as I put this dress on her and sat her down to take a picture she jumped up and took off zombie running! So I now have about 20 pictures of her running away from me laughing at me. So imagine this on a baby. It turned out really cute! I haven't posted in a few weeks. I know. But I have converted Dave to the Great British Baking Show and have been CRAVING these since we watched the episode since they made these (we watched it several weeks ago). I shouldn't eat gluten since I'm intolerant, but I just HAD to try the recipe. They turned out so well I had to give the extras away to neighbors so I wouldn't eat them all and I've had a few requests for the recipe. Since I had to convert it from British, I decided to just post it and make it easier on everyone. Side note, I did a TON less salt and seeds than the recipe called for. Poppyseeds called for 5 T but I did 2.5 because I ran out and it was Sunday so I wasn't going to head to the store. I swear you just don't need that much salt. Also, My pretzels weren't brown enough. I pulled them out to check them and the boys dug in before I could put them back. But they were still hard and tasty like they are supposed to be. This is a hard on the outside, Italian type pretzel. Not soft like you find at the mall. I'm sure if you cooked them less they could be more bread like. 1. To make the dough, put the flour, salt, yeast and butter into a large mixing bowl. Add the honey to the milk and stir well until dissolved. With your hand, gradually work the milk mixture into the flour, and keep mixing to make a stiff, non-sticky dough. 2. Turn out the dough on to a worktop (the dough shouldn’t need any extra flour for kneading). Knead for about 10 minutes until the dough is smooth and glossy. Divide it in half and put one half into an oiled bowl. Add the orange zest and poppy seeds to the other portion of dough and work in until evenly distributed. Put this dough into another oiled bowl. Cover both bowls with saran wrap and leave to prove for about 45 minutes until doubled in size. 4. Bring the water to the boil in a large pan, then add the baking soda. Gently drop a pretzel into the boiling water and leave for 5 seconds, then carefully remove with a slotted spoon and set on a lined baking sheet. Continue blanching all the pretzels, keeping the differently flavored pretzels separate. While the plain dough pretzels are still wet from the pan sprinkle over the rock salt and sesame seeds. 5. Make a deep slash into the thickest part of the dough (the central bulge of the pretzel) using a small sharp knife. 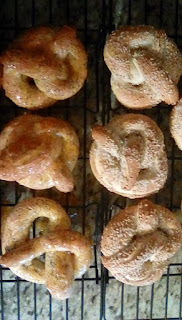 Place the pretzels in the heated oven and bake for 20-25 minutes until they are a deep brown. 6. Meanwhile, make the glaze for the sweet pretzels. Put the orange zest and juice and ½ c of sugar into a small pan. Bring to the boil, stirring to dissolve the sugar, and boil for 1 minute. Lift out the zest with a slotted spoon and roll in the rest of the sugar in a small bowl. Boil the orange syrup until reduced and sticky, then strain through a fine sieve. 7. As soon as the pretzels are baked, transfer them to a wire rack. Quickly brush the sweet pretzels with the syrup glaze and scatter over the candied zest. Leave to cool. 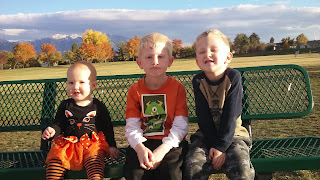 I've been trying to get a good picture of the kids all fall. They do not want this, so it's been extremely hard. This is the best one I could get. Brooklyn is always ready to smile and look cute for the camera though! I love these kids even if they are always making a mess and getting into trouble. We received a letter stating City hall was giving away bags to collect leaves in. We went down to get some the first day they were giving them out at 11am only to be told they had already given away all 40 boxes of leaf bags. 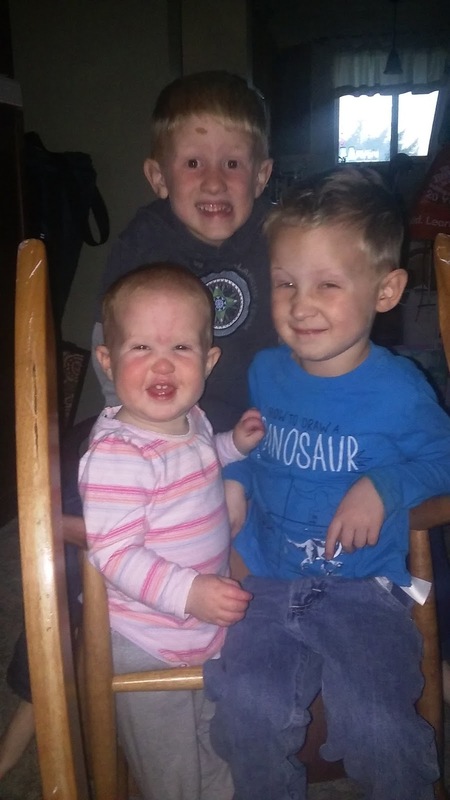 So I tried again to get a cute picture of the kids. Only Brooklyn cooperated. One of our big jobs for the week was to tear out the tomato plants in the garden. 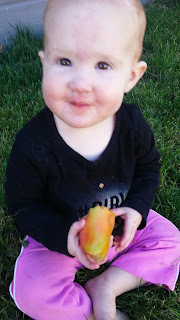 Brooklyn loved eating all the not quite ripe tomatoes that fell on the ground. I saved all the ones that didn't have little bite marks to ripen on the window seal. Last weekend we had tickets to go to a Grizzlies hockey game! The kids won them from completing the Summer reading program at the Library and it was fun to go see a game. It took a little while for the boys to get into it, but by the end they were enjoying themselves. Brooklyn and I had fun though! Saturday we also attended our ward's chili cook off and costume party. I was glad to not bring anything to the event and to get to enjoy chili, cornbread, and candy. The kids had fun playing with their church friends. On Halloween Logan's school had it's annual parade! This year Dustin was less than pleased to attend. He didn't want to dress up and he didn't want to sit in that loud, noisy gym waiting for his brother. Brooklyn started throwing a fit when the parade started and cried until Logan's class walked through and we left (early). But Logan was happy we got to see him, and that's what counts. 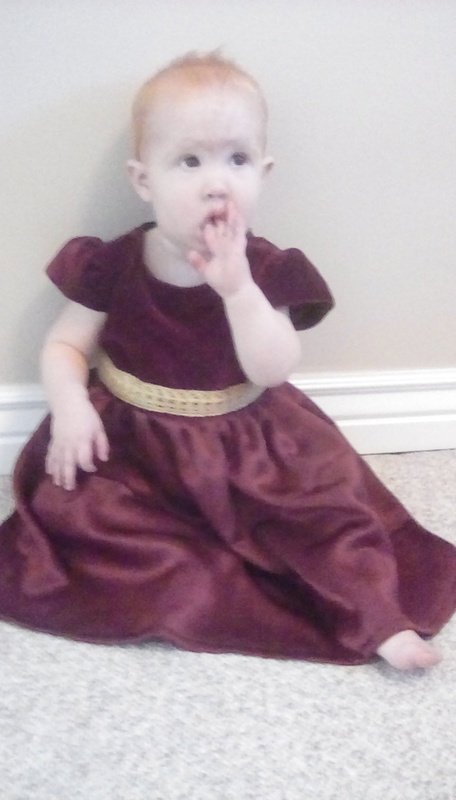 This year I failed to get a picture of our whole family or the three of us together on Halloween! The boys always want to be super heroes! 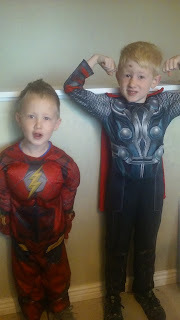 Dustin wanted to be Hot Flash (he's convinced this is Flash's full name) and Logan was Thor. 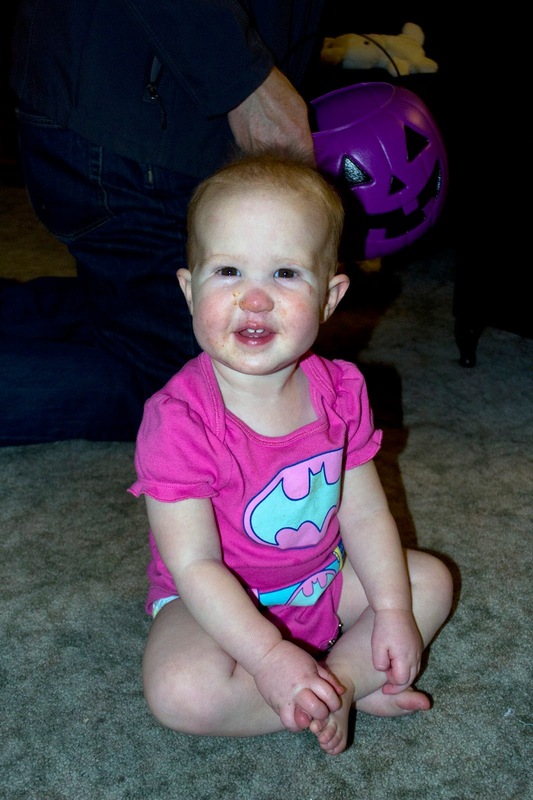 I wanted to dress Brooklyn up as something girly, but the boys and Dave insisted she would make a great Batgirl. 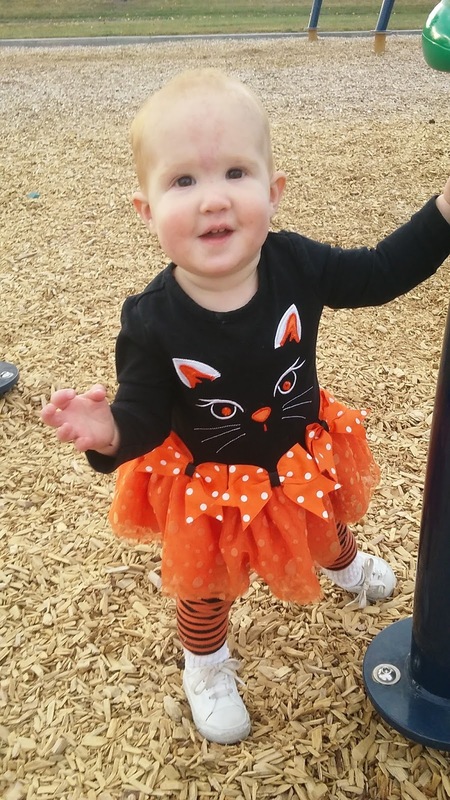 When we took her out she had leggings, a long sleeve shirt and a cape, but she preferred to just wear her onesie when we got home. We trick-or-treated our street and did the ward trunk or treat and somehow still managed to fill out the boys pumpkins! They were in heaven! 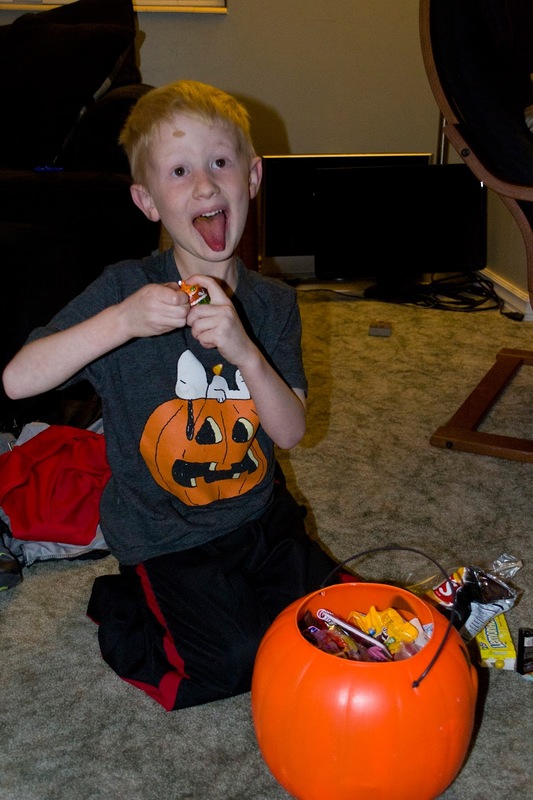 Candy galore! We only grabbed like 6 pieces of candy for Brooklyn but found out that wasn't nearly enough for her! She ate a ton of the boys candy. Good thing she's cute and the boys didn't mind sharing with her. Next year we'll get her all the candy!!! Here's a video of Brooklyn bouncing off the walls when we were trying to get her to sleep. For those who don't believe in sugar high... Here's your 9pm proof! This weekend was full of work! We installed our new dishwasher, replaced the bathroom sink and all the stuff underneath the sink. It was leaking from two places and we figured we might as well replace the second valve while we were in there. It probably would have gone bad soon anyway. That might not sound like a lot of work, but it consumed Friday and Saturday. Oh, I guess Saturday morning Dave helped a neighbor put shingles on the roof of his house too. They started the previous Saturday but since only Dave, the owner and one other guy showed up they had to work on it this Saturday as well. I started meal planning for the month of November. I've got big plans to make extra food to freeze for December so the holiday season runs smoother. With being sick and not having a dishwasher for the past month I've really been struggling with wanting to cook, so hopefully this kicks me back into gear. We'll see how it goes.